The first English printing press was invented by William Caxton in 1476. Printing for centuries afterwards was 'calligraphic', which is to say it imitated handwriting. This was a time-consuming and very expensive means of printing, which only began to be superceded by typography in the 18th century. 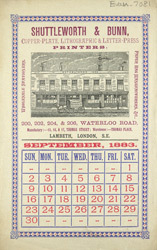 19th century printing was revolutionised by Alois Senefelder. In 1800 he invented lithography, a crude but effective method of black-and-white printing, which used the chemical incompatibility of grease and water to produce cheap, high-contrast images and text.